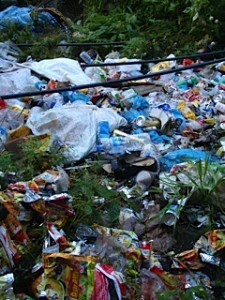 Fortunately or unfortunately, I stumbled on the village dump where a mass of plastic mineral water bottles, alfoil noodle packets, sweet wrappers and general rubbish lay in a tumbled pile only metres away from the rushing stream. It fuelled my determination to see whether action can be taken to replace this mad transport of bottled mineral water, with all the effort and waste-generation involved. Our Phakding tea-house offered UV sterilized water for 50 rupees a litre, so I could envisage each major village along the trekking route supplied with UV facilities and trekkers being required to re-use their own water bottles. According to Tirthe, plastic water bottles are banned on the Annapurna circuit, after efforts by the Annapurna Conservation Area Project (ACAP) to reduce pollution and energy consumption. The situation is complex in Solo Khumbu, as several local water companies have been established that use UV filtration to produce and sell mountain mineral water to the passing trade – in plastic bottles. I said a prayer for sanity and sustainability as I passed the mani wall on my way back to breakfast. As we set off for our final trek to Lukla, the valley became more populated with villages and the track busier with the onset of the trekking season. We passed many groups heading uphill – four doctors from Himalayan Rescue Association going to staff the Pheriche Aid Post for three months; an efficient-looking troupe of Korean climbers off to tackle Lhotse; small groups of two or three backpackers taking on the journey with a single porter. The volume of supplies needed to feed and water all those locals and foreigners involved in the annual trekking season must be enormous, and we saw many huge loads being carried past on the backs of men, horses and yaks. I believe the expectation of the modern trekker to continue their comfort food habits in the mountains has only multiplied the demand. 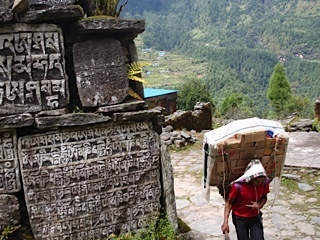 Somehow I felt more comfortable seeing porters carrying apples and onions, rice and potatoes than to see them forging uphill under vast bundles of Fanta, Coke, plastic bottles of mineral water, Pringles, Snickers and Mars Bars… The size of some loads is unbelievable. We stopped for a welcome Nashi pear break, looking out over the valley, before heading on down to the Wind Horse tea-lodge. In the days we’ve been away, the trees cut down for the new hydro power station have been industriously sawn into beautifully straight planks for building. There is much construction of new accommodation and tea-houses, indicative both of the ongoing popularity and relative wealth of the Solo Khumbu region. A final long haul uphill, pausing to admire the biggest ancient oak of the journey, and up the last stone staircase to the archway commemorating the first Nepalese woman to climb Everest and through the cobbled street of Lukla to a well earnt beer at the Mera Hotel.